Liquid Web Review 2019: Is Liquid Web a Good Hosting? Liquid Web has a lot to offer, with a wide variety of business hosting plans, excellent infrastructure, and superior security. Not many hosts can promise better uptime and stability, and WordPress users are sure to love the Managed WordPress features. On the surface, everything looks good, but when I dug a little deeper, I uncovered a couple of flaws. Read on to learn more. Liquid Web offers high-end hosting solutions for businesses that require extensive resources. Founded in 1997, Liquid Web now hosts over 500,000 websites for 30,000 customers spread across 130 countries. That’s impressive. You won’t find your typical low-budget shared hosting plans here. Liquid Web means business – business hosting, that is – and as such, it offers managed WordPress and WooCommerce hosting, alongside a variety of cloud-based hosting plans, dedicated servers, and custom solutions for businesses with complex requirements. Premium hosting comes at a premium price, and before you make that kind of investment, you want to be sure you’re going to get your money’s worth. That’s why I set out to test every aspect of Liquid Web’s hosting, from special features and ease of use to the company’s famous customer support, which comes branded with the charming (and trademarked!) slogan: The Most Helpful Humans in Hosting. Read on, and we’ll see about that. We’ll also see how Liquid Web scores in terms of speed, performance, and reliability, and we’ll take a closer look at those prices. It’s always nice to see a web host with an impressive customer base, but at the end of the day, you’re not just any customer. You and your business have your own specific needs. By the end of this review, you should be able to determine if Liquid Web is the right host for you. Liquid Web offers solutions for businesses of all sizes, from freelancers to e-commerce entrepreneurs to mega-corporations. Developers, designers, and agencies are sure to appreciate the special collaboration and management features. Liquid Web is known for its custom-built solutions, making it popular with the enterprise-level crowd. But for this review, I’m going to focus on Liquid Web’s Managed WordPress Hosting services. 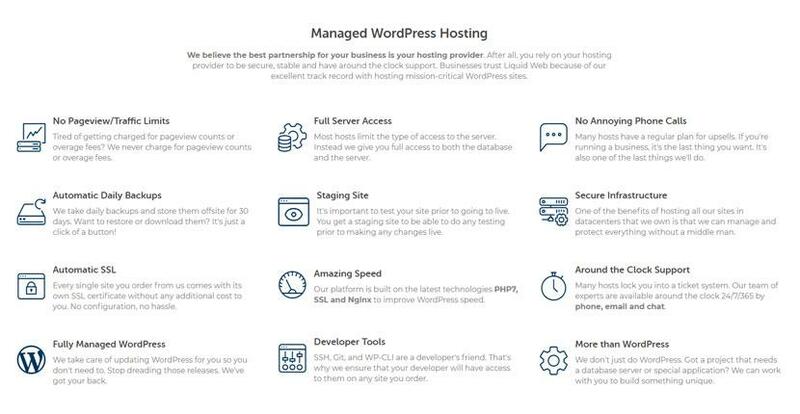 Now, I’ve been around the hosting block at least a couple of times, and I’ve seen hosts that will just take a regular shared hosting plan and market it as “WordPress hosting.” Liquid Web isn’t one of those. 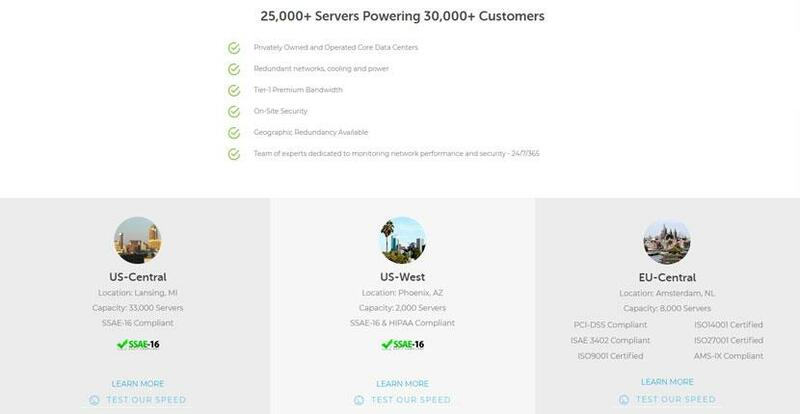 We’re looking at a premium Managed WordPress host here. This means it’s got the specially-optimized infrastructure you need to keep your WordPress website running smoothly. Now, let’s take a closer look at some of the more advanced features Liquid Web has to offer. Liquid Web’s staging feature, called ‘Stencils’, allows you to create a copy of your WordPress website, so you can work on it offline without affecting the performance of your live website. Many hosts out there offer various staging platforms, but what makes ‘Stencils’ unique is how easy it is to use. You can create a stencil with one click, and you get a distinct dashboard for your staging sites. All Liquid Web websites come with full SSL certificate protection by default. The entire network, power, and cooling infrastructure are also fully redundant, and the servers are guarded by 24/7/365 on-site security. I don’t know about you, but I sleep better at night knowing my website is safe and sound behind multiple layers of protection. Liquid Web owns and operates its core data centers, with on-site technicians available around the clock to diagnose and resolve any issues on the spot. In a world where many hosts just lease a few servers in someone else’s data center, that means a lot. Liquid Web’s five facilities are located in Central and Western United States as well as in the Netherlands. These data centers are SSAE-16, HIPAA, PCI-DSS, AMS-IX, and ISAE 3402 compliant as well as ISO9001, 14001, and 27001 certified. You can sign up for Cloudflare CDN, set it up, and manage it through your Liquid Web dashboard. If you’ve ever tried to do this on your own with the limited support most other hosts offer, you know this is a huge plus. Whether you’re a freelancer or part of a big agency, you’ll find that Liquid Web provides you with the tools you’ll need. On top of SSH, Git, and WP-CLI, you also get full server access. Liquid Web will even accommodate special requests for anything your project may require, such as a database server. Liquid Web provides a fantastic UI with powerful tools, but it’s not the most beginner-friendly. If you’re new at this, it may take some getting used to. Once you get settled in, Liquid Web’s super-smooth user experience will make you feel at home. But before you get there, you’ll have to go through a slightly complicated process of connecting your domain and setting up your CDN. Creating a new account with Liquid Web is quick and easy. The whole process shouldn’t take more than a few minutes. I walk you through it in my step-by-step guide. However, you do have to wait for an obligatory verification call with a support engineer, and this can take anywhere between 30 minutes and a few hours. This shows you Liquid Web is a serious company, but it can be somewhat inconvenient to have to talk to someone just to sign up for a hosting plan. Liquid Web caters to large businesses who have their own IT professionals, but for this part of the setup process, it seems like the company really isn’t taking its smaller customers into account. You’re definitely going to need some technical experience here. I’ve got quite a bit of technical experience myself, but I must say, I was feeling lost during those first steps, with very little guidance on what to do next. If you plan on setting everything up on your own, you’ll need some knowledge on connecting domains and setting up CDNs to get through the process. You should plan on investing some time in chatting with support or studying the documentation. You’ll have to figure out how to configure your DNS records and complete some other technical tasks. If you’re not sure how to do that, you’ll find a lot of help in my step-by-step guide. Even if you do have some technical experience, expect to spend no less than 30 minutes on this. It will be longer if you want to set up the Cloudflare CDN as well. Liquid Web gives you one dashboard to manage your account and other background services, and another dashboard – known as your Managed WordPress Portal – where you create and manage your WordPress websites. The two separate dashboards are both simple to use, and the Managed WordPress Portal is clean and polished. I’ll admit that I liked the whole setup once I got used to it, even though it took me some time to figure it out. Making sure all your WordPress websites are always up to date can be a real pain. Fortunately, Liquid Web takes care of that for you on the backend, while making sure none of your plugins conflict with each other before they’re implemented on your live website. You can use Liquid Web’s nifty Visual Comparison Tool after each update to check if there are any visual changes to your site. You can easily enable or disable automatic WordPress updates and plugin updates from your Managed WordPress Portal. Liquid Web automatically backs up your website(s) on a daily basis and saves these backups for 30 days. You’ll be able to easily restore or download them right from your Managed WordPress Portal. Liquid Web is probably not the best option if you don’t have any prior web hosting experience. However, if you’re a fast learner or an experienced user, you’ll enjoy the freedom and control it gives you further on down the road. Liquid Web will make sure your website is (almost) never down, but don’t expect it to load with blazing speed. If I had high expectations for Liquid Web in one aspect, it was performance. After all, it’s a premium hosting provider that caters mostly to business clients. Liquid Web offers a 100% network and power uptime guarantee backed by an unheard-of 1,000% compensation for downtime. The uptime history is actually published on the company’s website. According to the detailed chart, there was only one month with downtime (June, with 99.84% uptime) during the entire year of 2018. That’s impressive, but uptime isn’t everything. You know your visitors aren’t going to sit around waiting for your site to load. You want it to load fast – really fast. I decided to run a Sucuri page load test to see what Liquid Web has to offer in terms of speed. I was surprised to see that Liquid Web only scored a grade A. The highest grade is A+, and I’ve seen other top hosts achieve it easily. Sure, this doesn’t translate to much of a difference in terms of actual loading times, with most U.S. locations loading in between 200 and 500ms. But still, I was expecting a perfect score. Australia and India performed pretty badly, but this is the case with most hosts. What was particularly disappointing was that India actually crossed the two-second mark. That is the point where you start to lose a significant number of visitors. Liquid Web certainly speaks proudly of its support on its website, promising 24/7 “100% human” support, 365 days a year. The company guarantees response times of under 59 seconds for phone call pickups and live chat response, and under 59 minutes for ticket support. There’s also an extensive knowledge base with step-by-step tutorials for just about everything. My first contact with support came pretty early in my hosting relationship with Liquid Web: I couldn’t figure out how to connect my domain. I wanted to get things rolling and I needed a speedy response, so I decided to reach out to the live chat support. My first impression was good. I was connected with a support agent – who, indeed, seemed to be a human – almost immediately. However, he misunderstood my request at first, which led to some confusion. He thought I wanted to move my domain and DNS management to Liquid Web instead of keeping it at my current registrar and just pointing my nameservers to Liquid Web. Maybe I wasn’t clear enough, but it was slightly frustrating. To the human’s credit, he kept his cool and eventually gave me the answer I was looking for, as well as links to the step-by-step instructions. Still, I would have preferred for him to give me the instructions himself. My first interaction with ticket support was also a bit hit-and-miss. The first positive was that I got a super-quick email response: it took only five minutes from the moment I sent the query. The second was that in the email, there were four different links to relevant documentation explaining how to sign up with Cloudflare and set up my CDN. One thing I didn’t appreciate, however, was that I wasn’t given any kind of explanation directly from a support agent. I was only given the multiple links and left to go through them on my own. Because I was busy and couldn’t do all that right away, I sent a follow-up email. This time, I asked about Cloudflare and what was included with my plan, as well as how to set up the one redirect. They replied to my email within 36 minutes, but sadly, my first question wasn’t addressed at all. But hey, it’s only human. Liquid Web definitely isn’t the cheapest host out there. In fact, the lowest-tier plans are more expensive than the highest-tier plans of many other hosts. One explanation for this is that Liquid Web doesn’t really target beginner webmasters. Instead, it focuses on providing solid, customizable infrastructure for businesses of a larger scale. A nice thing about Liquid Web’s hosting plans is that packages tend to be all-inclusive, and the company doesn’t rely much on upsells. Unfortunately, Liquid Web doesn’t offer any money-back guarantees for managed WordPress hosting. However, it does offer contract-free hosting, meaning you can get a prorated refund for the unused part of your billing term. This applies only to the VPS packages, though. While Liquid Web doesn’t make it obvious how and where to cancel your hosting, I found out that you’ll need to submit a cancellation/non-renewal ticket to support. It also took about a day for my refund to be approved and I was sent eight (!) emails in total. You can read more about my experience in this article. There are very few hosts better than Liquid Web when it comes to availability and reliability. This host provides incredibly stable uptimes, a powerful dashboard, and a seriously secure infrastructure. However, I had very high expectations of Liquid Web, and I felt that they weren’t always met. Its performance was excellent, although I was a bit surprised that the hosting company didn’t garner a perfect score. The ticket support also could have been better, and I’m not a big fan of restrictive refund policies. That said, Liquid Web is an excellent choice for serious WordPress websites and businesses with specific requirements. Wondering how Liquid Web stacks up against other Web Hosting companies? Enter any other Web Hosting company and we will give you a side-by-side comparison.